My colleague M whom I had worked with at LST until March got married on May 31st. 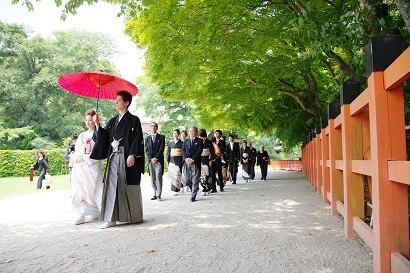 Under the blue sky, they had a solemn wedding ceremony at Kamigamo shrine. While she was working as a wedding planner at LST, it has always been her dream to have her own wedding at Kamigamo shrine and Saami ryoutei restaurant. The wedding reception at Saami was really in warm and cozy atmosphere, which was celebrated not only by their guests but also LST’s business partners. I did my best to support their wedding although it was hard for me to hold back my tears when I saw her smiling and then crying for joy. They looked so happy surrounded by their precious people. The day became unforgettable for me, too. Nahoko, the bride, was born in the season of sunflower. She is really like a sunflower, and always shined like the sun in LST. 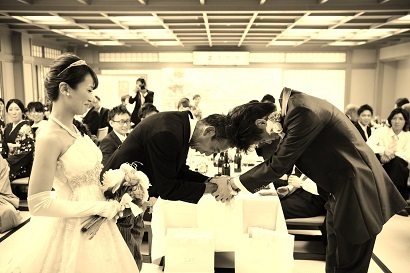 I wish her to spend the happy shining life with her husband for long.